NASHVILLE, Tenn. (January 3, 2018) – 2018 is a milestone year that marks the 55th Anniversary for a band formed in Richmond, Ky. in 1963. Crossover hit-making band, Exile, is celebrating the band’s distinguished career as the longest running self-contained vocal group. Exile has sold over 8 million records, including three Gold records and eleven number one hit songs, along with numerous hits on the pop and country charts. They are known for major hits including “Kiss You All Over,” “Give Me One More Chance,” and “I Don’t Want to Be a Memory,” to name a few. Exile music is available on all digital platforms here. Fittingly and appropriately titled the No Limit Tour, the trailblazing band has announced the first round of dates for 2018 and hints that they have a few more surprises up their sleeves to make this year memorable. Their most iconic hit, “Kiss You All Over” spent four weeks at the top of Billboard’s pop chart in 1978 and this year will commemorate the song’s 40th Anniversary. Exile formed in 1963 looking to play small clubs in Richmond, Kentucky, but managed to top both the pop and country charts during their over 55 year-long career. Their most successful hit, “Kiss You All Over” spent four weeks at the top of Billboard’s pop chart in 1978. In the early 1980’s Exile started to focus on country music. During their run on the country charts Exile has successfully had ten No. 1 singles including “I Don’t Want To Be A Memory” and “Give Me One More Chance.” They have toured with acts including Aerosmith, Fleetwood Mac, The Oak Ridge Boys, The Gatlin Brothers and The Judds. The 5 original Exile members re-formed in 2008 and continue to tour today. Current members of the band include J.P. Pennington, Les Taylor, Sonny LeMaire, Marlon Hargis and Steve Goetzman. 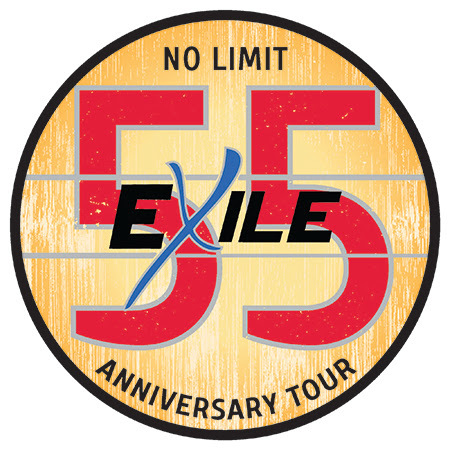 2018 celebrates 55 years for the band and 40th anniversary of the hit song “Kiss You All Over.” For more information, visit www.exile.biz.